How many pianists with increased finger width are forced to create unnatural fingerings or hand positions as a result of their playing comfort is being severely impacted due to the narrowness between the black keys? In fact, there have been many that have experienced this problem, including some famous pianists like Arturo Benedetti Michelangeli *. For centuries since the piano was invented, there has been a noticeable trend toward increased individual’s heights and subsequent enlarged bone structure, contributing to increased finger sizes. Thus, pianists found it more difficult to reach the white keys because their forefingers, ring fingers and especially middle fingers did not fit in the space between the black keys. In the quest for keyboard improvements, keyboard producers simply tried to modify the white keys’ width between the black keys. Others drastically reduced the width of the black keys which resulted in lack of top surface support and in loss of the guiding function for the fingers. These efforts, however, never produced satisfying results, with no one considering a truly ergonomic solution that would mitigate the troubles that even virtuoso pianists had been experiencing. 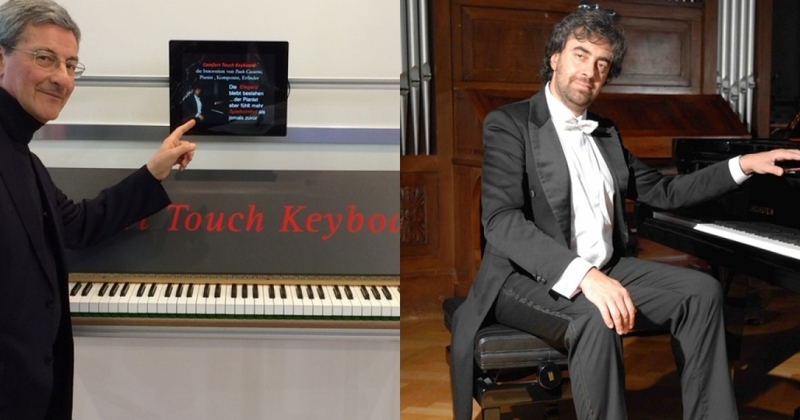 Finally, an Italian composer and pianist, Paolo Ceccarini invented the internationally patented Comfort Touch Keyboard. After years of study and meticulous trials, Paolo found the unique and optimum solution: the reshaping the black keys that included differentiating the key size of the two groups of sharps (C-D and F-A), the most impervious zone of the keyboard. The true "power" of this innovative and ergonomic concept was that it focused on optimizing the black key design without altering the white keys’ position, with the current keyboard configuration maintained. This black key redesign has preserved the required upper finger support while providing additional clearance between the black keys to achieve improved playing comfort. The centerline of each key has remained unchanged. The elegance and beauty of the traditional keyboard continues with the eye unable to perceive any differences, allowing the pianist to experience more playing comfort than ever before.